When the desert tortoise was listed as threatened under the Endangered Species Act in 1990, initial research and anecdotal evidence suggested human impacts were chiefly responsible for driving down the tortoise population by as much as 90% in the preceding hundred years (Berry, Kristin; Status of the Desert Tortoise in the United States). The accuracy of the estimate from that 1984 study has been questioned by some, but none doubted that the tortoise had indeed experienced a significant population decline by the early 1980s. Advanced research looking at the status of the desert tortoise since just 2004, however, has revealed a continued decline despite the efforts of many conservation groups and agencies to stabilize its population. Evaluation of the tortoise's status across its range - which spans parts of California, Nevada, Arizona and Utah - is broken down into five "recovery units." Only one of five recovery units experienced a population increase. The overall population decline between 2004 and 2014 is estimated at 32%, with localized declines of as much as 67%. A chart that will be further explained below shows downward population trends. We have been attempting to stabilize and recover the desert tortoise population for 26 years. In the past ten years alone the species has continued a significant population decline throughout much of its range, with the exception of the northeastern Mojave. Although, now, the northeastern Mojave faces significant development pressures. 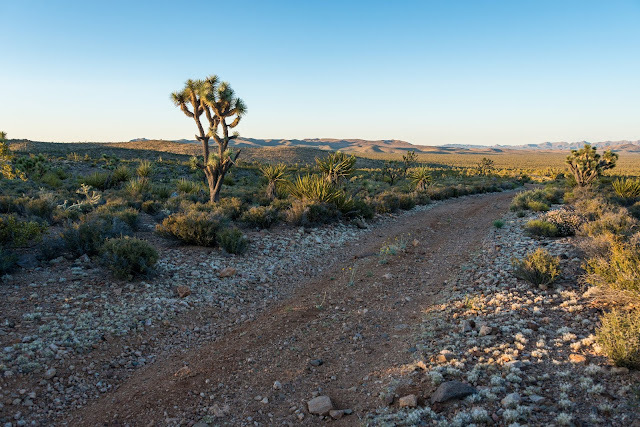 The steepest declined occured in the Eastern Mojave Recovery Unit, where Interior has permitted four utility-scale solar projects in the narrow portion of a key habitat linkage. Between 2004 and 2014, the tortoise population here dropped by 67%, according to the Fish and Wildlife Service report. That is the estimated decline during just a portion of the 26 years that the desert tortoise has been listed as Federally protected, and millions of dollars spent on its recovery. 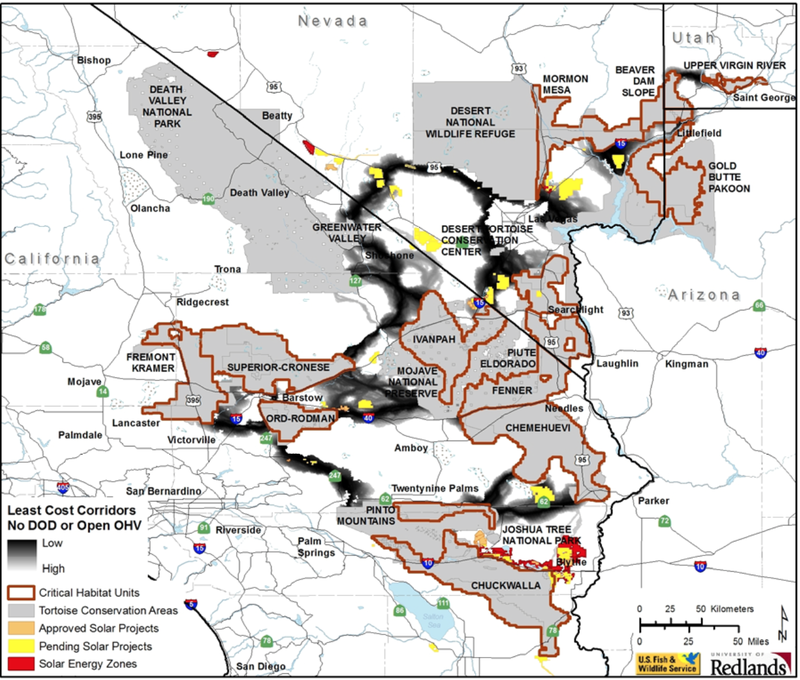 Other habitat linkages in the Amargosa and Pahrump Valleys iare now threatened by other proposed energy projects. In the Western Mojave Recovery Unit, the tortoise population as declined by as much as 51% since 2004. The is where a checkerboard of Federal and private land poses a challenge to unified conservation efforts, and urban sprawl and transportation projects chip away at habitat connectivity. Urban sprawl around the Victor and Lucerne Valleys, the expansion of training areas for the Twentynine Palms Marine Corps base, and the Johnson Valley Off-Highway Vehicle Area all threaten to significantly fragment habitat and isolate tortoise populations over time. In the Colorado Desert Recovery Unit, the tortoise has experienced a 36% decline since 2004. 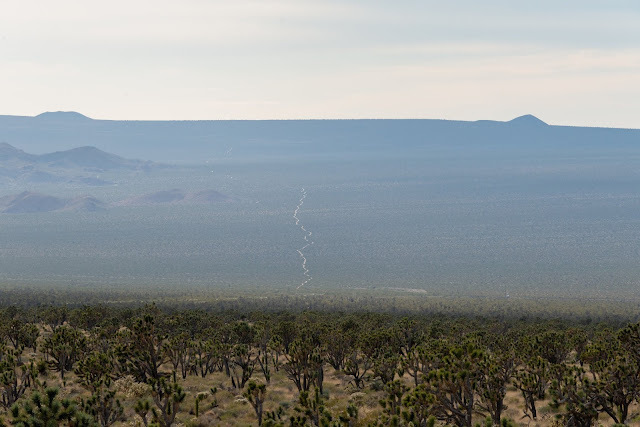 The protection of some of its habitat in the newly designated Mojave Trails National Monument may help maintain some linkages that had previously been targeted by energy development. The Upper Virgin River Recovery Unit has seen a 27% decline; tortoise habitat around Saint George is in the crosshairs of sprawl and road development. Only the Northeastern Recovery Unit between Las Vegas and Utah has seen a significant population gain - a 270% increase - but these gains may be in peril as a key linkage may be affected by the Dry Lake Solar Energy Zone and energy projects being permitted in the area. Other studies of the tortoise's status also caution that it is difficult to extrapolate rangewide health from the current numbers because we should think of the tortoise not as a species that fills the desert uniformly, but slowly occupies and disappears from patches of the desert over time (although the apparent decline throughout the majority of its range is what is most troubling). But the tortoise's ability to maintain this population dance - natural population variation across its entire range - requires habitat connectivity. Once connectivity to a certain portion of its range is lost, that local population may die off and not be re-populated later because tortoises can no longer naturally reach that patch of habitat. The more we fragment the tortoise's range, the more difficult it will be for the species to maintain healthy populations without significant human intervention. A key study published in 2013 by Roy Averill-Murray and other experts identifying remaining habitat linkages also calls out proposed energy development that could jeopardize them. Some of these linkages are the best remaining alternative because other natural linkages have been foreclosed by previous development, such as off-highway vehicle recreation areas, military training and urban sprawl. The Department of Interior did not get the memo. 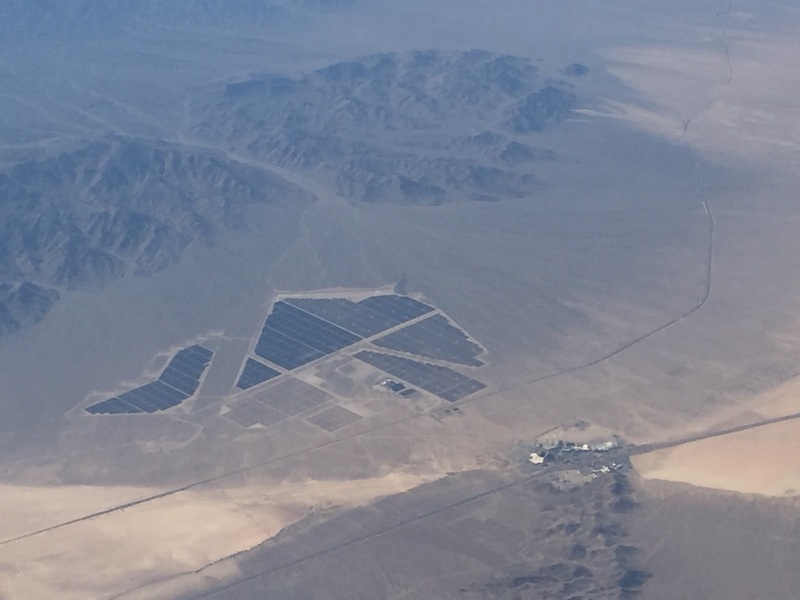 It proudly announced in 2014 that it approved permits for First Solar to construct the the Silver State South and Stateline Solar projects in the eastern Mojave Desert, despite concerns that the projects would significantly narrow a key tortoise linkage by destroying nearly six and a half square miles of intact habitat. Interior ignored initial advice from the Fish and Wildlife Service and pressured biologists to justify the narrowest corridor possible. At the end of the day, First Solar was required to pitch in some money to protect desert tortoise habitat elsewhere, and monitor the status of tortoises that it displaced for the sake of the project. Long-term, however, the viability of this linkage made narrower by the solar projects is now in question. The Silver State South and North Solar project pictured above significantly narrowed a key habitat linkage in the Ivanpah Valley. 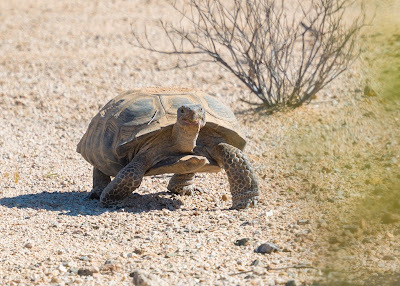 Two other solar projects nearby further impacted the Ivanpah Valley's tortoise population. 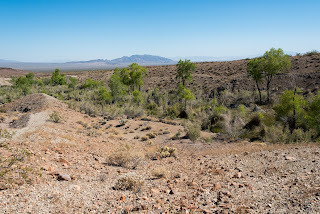 Elsewhere, the BLM's draft Las Vegas Resource Management Plan proposed three new solar energy zones within or on the edges of key tortoise linkages in southern Nevada. Other wildlands in the Pahrump Valley considered "priority 2" tortoise habitat under the Solar Programmatic EIS are being targeted by utility-scale solar developers and new transmission lines. Considering the importance of threatened habitat linkages - those we have identified and those that we have not - it seems possible that the tortoise could slowly become extinct from portions of its range that are already highly fragmented, unless humans artificially intervene to stabilize populations and ensure genetic exchange. This seems to be far from the point of the Endangered Species Act - instead of recovering a species we are essentially managing its decline. To sculpt down and chop up tortoise habitat, and then keep the remaining populations on life support. Tortoise translocation has seen a lot of press over the past few years. Reporters tagged along with BrightSource Energy staff as they relocated tortoises displaced by the Ivanpah Solar project, and newspapers highlighted the delayed plans by the US Marine Corps to relocate tortoises from a newly-designated training area in the eastern Johnson Valley. But despite years and multiple translocation efforts, Interior's management of tortoise translocation seems haphazard, guided by a patchwork of research with uneven implementation and results. New research helps provide some parameters to guide translocation efforts to reduce tortoise deaths in the months and years following relocation. A recent study suggest that tortoises relocated to habitat nearby fare better than those relocated long distances, specifically looking at the fate of some tortoises relocated from the Ivanpah Solar project. When tortoises are removed from their home range, they become more active and spend more time looking for burrows or forage, according to the study. The study says that eventually they'll settle into a new routine and probably wont be as vulnerable. 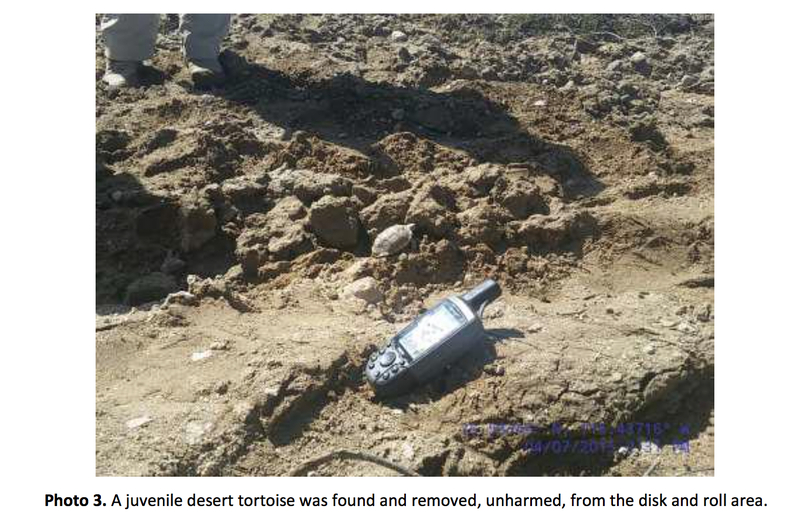 Not all tortoises are as lucky as this juvenile (center of photo, just above GPS device placed for reference), spotted coincidentally after bulldozers already began destroying its habitat to make way for the Stateline Solar project in the Ivanpah Valley. Most juvenile tortoises probably are not spotted during clearance surveys, and are crushed during construction. Previous research suggests drought at the time of relocation worsen's a tortoise's survival chances, making them more vulnerable to natural predators. Despite research suggesting some relocation efforts can be implemented successfully, an examination of recent translocations suggests results are uneven, and translocation efforts across Interior seem disjointed. That said, just getting a hold of translocation results can be difficult; some offices are happy to dig up data while others require FOIA requests. For example, the Department of Interior in June of 2012 announced that it approved the Moapa Solar project on the tribal trust land of the Moapa Band of Paiute Indians. Since then, bulldozers have cleared over three square miles of intact desert habitat to make way for photovoltaic solar panels - the same technology that companies can also install on rooftops or as shade structures over existing parking lots. Little public scrutiny was accorded to the environmental review of the Moapa Solar project, shepherded by Interior's Bureau of Indian Affiars. The project's environemntal impact statement and biological opinion required that tortoises found on the project site be relocated to nearby habitat and for the data to be reported to the Department of Interior. Initial efforts to obtain the information on the status of tortoises displaced by the Moapa Solar project were rejected, and Interior indicated that the information belonged to the solar developer. This same type of data is routinely made available for other projects approved by the Department of Interior. Eventually the information was released by the company and it was not good news. According to information submitted by First Solar to the Fish and Wildlife Service, at least 22 desert tortoises of a total of 66 translocated tortoises had died as of 2015 after being displaced by the massive project. Another nine could not be found. That's a significant failure rate, even though the translocation should have benefitted from knowledge gained during other translocations. Another problem with these numbers is that they do not provide the full picture of impacts on the tortoises. Approximately 90 additional tortoises were passively excluded because biologists determined that at least a portion of their territory existed outside the project boundary. But those tortoises are still losing some of their habitat and are likely exposed to additional stresses as a result of the project. The data made available by First Solar does not discuss the fate of these excluded tortoises. Who Is Tracking All of the Tortoises? Not all projects result in a mortality rate as bad as the Moapa Solar project. But it's not clear that the Fish and Wildlife Service is enforcing standards in how translocations are monitored and evaluated. In response to correspondence with multiple offices across Interior, I have found that data on translocation efforts can come from private contractors, the Bureau of Land Management Field Offices, Bureau of Indian Affairs, or the Fish and Wildlife Service. The data for each project almost always is provided in a different format. There is a central website for the Fish and Wildlife Service's Desert Tortoise Recovery Office, but I was never pointed to a central office that might track translocation efforts across Interior's many jurisdictions. For the Ivanpah Solar project translocation, the Fish and Wildlife Service is supposed to compare results to a control population of tortoises to determine if the translocated tortoises are susceptible to a higher degree of mortality than those elsewehere in the same area. When I asked Fish and Wildlife Service if the current results revealed a statistically significant different, they had not yet done the analysis. But at least they had the data. The Moapa Solar project translocation monitoring data made available by First Solar did not include information on a control group with which it could be compared. So there is no way for the public to know which translocation efforts are succeeding or failing, or by how much. 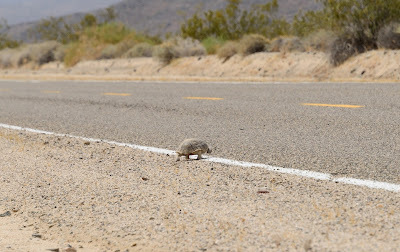 Another difference I found was that Fish and Wildlife Service established a "take threshold" for translocated tortoises - a maximum allowable number of tortoises that might perish after relocation - for the purpose of some energy projects in the Ivanpah Valley. If mortality of translocated animals exceeded the threshold, they would have to re-initiate consultation with the Fish and Wildlife Service to determine if anything different needed to be done to ensure that translocation was more successful. Based on correspondence with Interior, it does not sound like a take threshhold was established for the animals translocated to make way for the Moapa Solar project. It's not clear why Interior would establish a threshhold for some projects but not others. A tortoise prepares to cross a two-lane road in the Mojave Desert. A form a habitat fragmentation, but not as serious as some of the wider highways, urban sprawl, and massive energy projects. Most of the public's attention may be focused on occassional news stories about specific projects or translocation efforts, a public relations battle that Interior fights with sometimes upbeat reviews of its own mitigation and translocation efforts. But the public's - and most likely Interior's - grasp of translocation effectiveness seems elusive. Regardless of the effectiveness of translocation on a project-specific level, the overall tortoise population remains in trouble. It seems that land managers are actively and passively making decisions that sculpt down the tortoise's range, ignoring a drumbeat of research on the importance of key habitat linkages and accepting the risk that the tortoise may struggle to inhabit or go extinct from portions of its range over the long-term. Tragic! I have met some of the Biologists from the BLM. Only two words for them Goof Troop. There science is dump and leave. Go home and count the money and laugh at us the suckers. I 100% Hate the Evil Fish and Wildlife and BLM. I'm not sure what I can do myself, but is there anything that the average Joe or Jane can do to help save the Desert Tortoise? Involve yourself in federal agency planning processes that may affect the desert tortoise, such as new proposed actions, revisions of resource management plans, new monument planning and the Desert Renewable Energy Conservation Plan (DRECP) or individual renewable energy projects. Attend planning meetings, comment on proposed actions affecting tortoises on public lands managed by the Bureau of Land Management (BLM) and private lands where individual county agencies make development permitting decisions. Consider becoming a member of the Desert Tortoise Council or Defenders of Wildlife to support research on the species, as well as advocacy on behalf of tortoise recovery across its historic range.